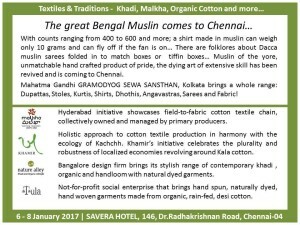 Various organizations working with weavers & farmers from across India like Malkha (Hyderabad) , Nature Alley (Bangalore), Khamir (Kachch, Gujarat), Tula organic clothing and display and sell a whole lot of eco-friendly, organic, natural dyed garments, contemporary handloom products, the great Bengal Muslin and more. Pl spread. come, support , buy and empower more livelihoods , encourage ethical ecofriendly products. Muslin of the yore, unmatchable hand crafted product of pride, the dying art of extensive skill is coming to Chennai. Along with products from various groups that work with farmers, spinners and weavers. The number of lives (Livelihoods) one touches and betters/empowers is amazing, added to the intricate skill and art that goes in to these products. No wonder Mahatma Gandhi actually saw so much hope in khadi and advocated that as a way for gram swaraj. Mahatma Gandhi GRAMODYOG SEWA SANSTHAN, Kolkata brings a whole range of Muslin products= Dupattas, stoles, kurtis, shirts, dhothis, angavastras, sarees and plain fabric! This art which could not be matched by machines for a very long time, is being revived now. Khamir, from Gujarat, focusses on reintroducing a holistic approach to cotton textile production in harmony with the ecology of Kachchh, by facilitating the linkages of a sustainable local production chain from locally grown short staple cotton—thus providing income for small and marginal farmers, spinners, ginners and weavers. The Kala Cotton that they use requires very low inputs and is almost zero risk. The products they create, celebrate the plurality and robustness of localized economies in the face of mass homogenization and environmental degradation. Malkha from Hyderabad, stands for a decentralised, sustainable, field-to-fabric cotton textile chain, collectively owned and managed by the primary producers – the farmers, the ginners, the spinners, the dyers and the weavers. The Malkha way of making cotton cloth is an alternative to the present industrial model where ghettoization of the worker and pollution of nature is the norm. Malkha is an attempt, the first in modern history, to make yarn specifically for the handloom, to rid the artisanal textile chain of its dependence on large spinning mills that distort the small-scale, village-based nature of handloom cloth making,a pattern of textile production that was subverted by the Industrial Revolution model that respects neither nature nor society. Nature Alley, from Bangalore, brings its stylish range of contemporary khadi, organic and handloom with natural dyed garments to Chennai. By incorporating their social conscience to urban design sensibilities in khadi, Nature Alley creates a chain from farmer to weaver to tailor to handicraft artisan to customer to bolster local economy and reintroduce khadi as a mainstream fabric. Tüla from Chennai, is a not-for-profit social enterprise that brings to you garments from traditional Indian(desi) cottons originally grown by smallholder, rainfed farmers, with the Yarn hand spun by skilled khadhi workers and colored with natural dyes where required with expert guidance, with the fabric woven on handlooms by master weavers, with the garments stitched by women and men from economically and socially Marginalised groups. When you wear a Tüla garment, you can be sure that it is the lightest garment possible, both in its environmental sense and its fair/just trade sense. Dignified compensation to all across the value chain, livelihood betterment, being kind to nature, chemical and pollution free processes, yet stylish and contemporary! On January 6, 7 & 8 at SAVERA HOTEL, 146, Dr.Radhakrishnan Road, Chennai-04.